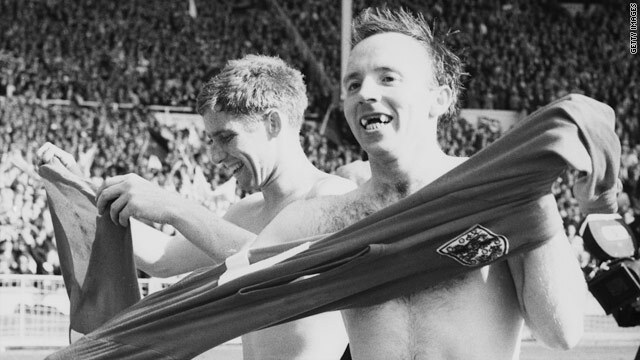 Alan Ball and Nobby Stiles, right, swap shirts following England's World Cup final win against West Germany in 1966. (CNN) -- Manchester United spent almost $300,000 on a World Cup winner's medal owned by one of the English soccer club's former players at an auction on Wednesday. Nobby Stiles, a member of England's winning team in 1966, received a total of £424,438 ($669,000) after putting his collection of memorabilia up for sale. United paid £188,200 ($297,000) for the 68-year-old's medal, which surpassed the £165,00 (£260,000) paid for the medal owned by Stiles' 1966 teammate Alan Ball in 2005. Scottish auction house Convery, which was involved in both those sales, said it was a new world-record price for a football medal at auction. Convery said United bought 10 of Stiles' 45 lots, including his 1968 European Cup winner's medal for £49,402 ($78,000). The shirt the midfielder wore in that final against Portuguese club Benfica sold for £30,582 ($48,000) and his cap from the 1966 Wembley match brought in £35,287 ($55,000). Stiles played 395 times for United from 1960-71 during a 15-year career that later saw him join Middlesbrough and Preston. He had a reputation as a tough-tackling player, whose appearance on the pitch seemed even more fearsome as he did not wear his dentures -- thus exposing the gaps in his teeth. "We're delighted to have acquired these items, which possess tremendous historical significance for Manchester United and English football, and look forward to proudly displaying them in our museum," said a statement on the club's website. Convery said the shirt worn by Ball in 1966 -- and subsequently swapped after the match with Stiles -- was sold for £51,755 ($86,000) at the same auction, which attracted worldwide interest from regions including Australia, Chile and the Far East.